Watch This offers movie recommendations inspired by new releases or premieres, or occasionally our own inscrutable whims. 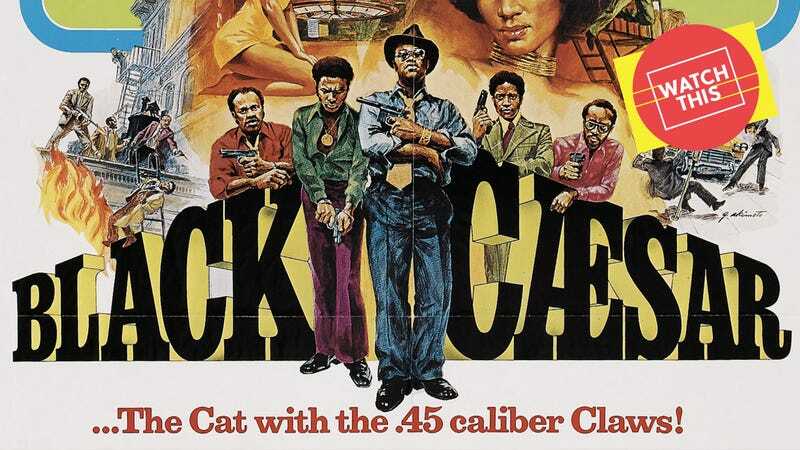 With the remake of the blaxploitation classic Super Fly opening in theaters this week, we’re looking back on the genre’s 1970s heyday. Fred Williamson is the face of Black Caesar, but James Brown is its soul. Brown dubbed himself the “godfather of soul” after composing the score for the film, one of only two soundtracks he did in his career. (The other was Slaughter’s Big Rip-Off, released the same year as Black Caesar.) Brown’s raw voice as he sings “So you try hard, or you die hard / No one really gives a good damn” in album centerpiece “Down And Out In New York City” perfectly encapsulates the politically charged cynicism of this uncommonly ambitious blaxploitation drama, written and directed by the legendary Larry Cohen. Despite its title, Black Caesar isn’t a remake of Mervyn LeRoy’s genre-defining gangster movie Little Caesar (1931) so much as “loosely inspired” by it. The operatic stakes in this tale of a tortured antihero’s rise and fall in the criminal underworld are the same, as is the personal resentment behind his ruthless lust for power. (The ’30s-style bowler hats Williamson wears throughout are also a nice touch.) Despite Williamson’s charisma, Tommy Gibbs is not a good person. He kills innocent people, abuses and assaults his wife, Helen (Gloria Hendry), and alienates everyone—even his own mother—with his violent, grudging attitude toward life. Along with his cynicism, Larry Cohen is famous for his lack of regard for such formalities as “filming permits” and “blocking,” and Black Caesar is full of his signature stolen shots, filmed guerrilla style on the streets of New York City. (In the documentary King Cohen, Williamson recalls working with Cohen with a laugh, saying, “I learned a great deal about how to steal from Larry Cohen.”) The technique is sometimes crude, but the energy of the city comes through in every stolen scene, filmed quickly before the cops could show up. I’m in New York City, in front of Tiffany’s on Fifty-Seventh and Fifth Avenue in my police uniform, directing traffic in the middle of the street. I hadn’t read the script at that time. I was simply posing as a New York policeman directing traffic. Fred Williamson came out of Tiffany’s and walked towards me ... I suddenly walked up to him, pulled a gun from my authentic New York Police Western costume, and shot Fred in the stomach. Fred grabs his stomach, hits the blood bag, and blood spurts all over the street. So the crowd is going crazy, looking at me shooting Fred Williamson who is now staggering across Fifth Avenue with blood spurting out of him. I disappear into the crowd, and chaos ensues. But, of course, out of a second-story window is Larry Cohen shooting the whole scene with a camera. That was the first shot in Black Caesar. In the shot—which made it into the final film—passersby stare at Williamson as he staggers past them, but most keep going. One good citizen stops to put his hand on Williamson’s shoulder as Williamson slumps onto a taxi cab, but walks away when the cab starts honking. No one really gives a good damn, indeed.